The week of Sept. 23-2014, thousands will march and meet all over the world to talk about, protest, and work together on and about climate change. I'm a Master Gardener and a co-ordinator for PLANTWATCH - I work with plants from the minute the snow melts in the spring until it falls again in the autumn. So, I am never surprised that the climate keeps changing - it has for hundreds of thousands of years and will continue to do so. I gave a little speech at a rally in Sept. between heavy rainfall, thunder, lightening and glorious sunshine - wow, talk about climate changing. 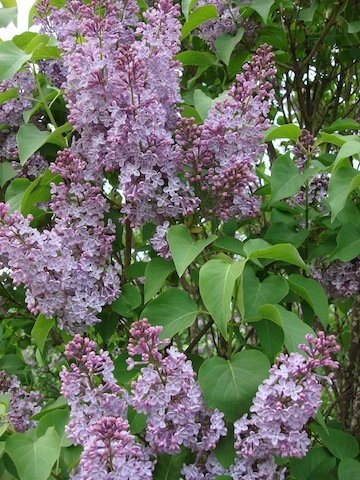 I was going to spout out loads of data about plants and how their bloom times have changed... flowering earlier like Lilacs, Trilliums and Dandelions (in Ontario, at least). But they- and you - have known all that and none of it would inspire you to change any of the little things each of us can to make a difference - every day. So,instead of that little speech, I am going to share the essence of an email many of us received a few days ago. I used some of those words and put in my own two cents. Whether we believe it or not, our climate has been changing for thousands of years. Year by year, decade by decade, it keeps on changing. And throughout those thousands of years, we have been adapting to that change. Unfortunately, now it is happening faster and faster. We can actually see those changes and the effect we’ve had on them. So now what?…. My guess is you are here because you are concerned and maybe even a bit frightened, and want to do something. But I say, we have been doing something. This public concern for our increased use of our natural resources may be new, but making a difference as individuals, is not new to us. There are some young folks who are convinced that in our day, we (the grandparents of those young folks) didn’t “do the green thing” - that we are the reason things are the way they are now…. and they are partly right… because back then we didn’t have “the green thing” . We took our milk, pop and beer bottles back to the store and they sent them back to th plant to be used over and over again. We bought our groceries in brown paper bags: which we used to cover our school books so they too, could be reused by the students who came after us.… now we call it recycling, ……..but back then, we didn’t do “the green thing”. We used the stairs - because every building and store didn’t have an elevator or escalator and we walked to the store instead of firing up a 300 horsepower gas guzzler for a few blocks. In the kitchen we blended and stirred by hand because we didn’t have more than one outlet in the room for all the appliances we seem to need now…. But of course, we didn’t do “ the green thing” back then. We sent packages packed with wadded up newspaper, not styrofoam pieces or plastic bubble wrap. Back then, we fired up our muscles instead of a gasoline engine just to cut the lawn. We used a push mower that ran on human power. We didn’t need a gym membership with treadmills that run on electricity because we exercised by working outside in the garden. We drank water from the tap instead of buying it in plastic bottles. Buying water at the corner store has made water a commodity that today, some cannot afford. Can you imagine our grandchildren not being able to afford to buy bottled water? We spend millions to purify our water and then we buy water in bottles that promotes the use of fossil fuels, filled with water that comes from - where??? Back then, we walked to school, rode the bus or our bikes - our moms were busy working or taking care of our homes instead of driving a 24 hour taxi service in a gas-guzzling SUV which cost the same as a house - but that was before we had this “green thing”. How sad that our grandchildren think we were wasteful because we didn’t have “the green thing” . No, we didn’t do “the green thing” but we did the right thing. Let’s keep doing that - and teach our children and grandchildren to do their part - now that we do have “the green thing”.